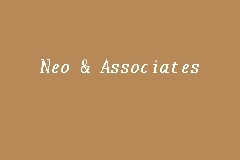 Neo & Associates is an Audit Firm with office located in Kluang, Johor. Contact them to learn more about all the corporate financial services that they offer. Neo & Associates is a member of the professional body Malaysian Institute of Accounts (MIA). licensed company auditors, tax agent, GST agent in Kluang, with more than 10 years of experience and a strong team, capable of delivering good service on time and at a reasonable fee.